In a country facing economic and societal crisis, Venezuelans have left their lives behind to seek safety in other countries. They have sold away their household goods in order to find proper food, livelihood, and medicine. Triggered by a plummeting economy, high rates of crime and violence, and an unreliable food supply, Venezuelans have called upon their neighbors to help them escape these conditions. Venezuela’s southern neighbor, Brazil, has helped to house many of these refugees. However, since Jair Bolsonaro’s election, Brazilians have exercised more opposition with Venezuelan refugees (Lloyd and Jarochinski Silva, 2018). These events have caused a rocky relationship between the leaders of Venezuela and Brazil. Brazil has experienced a significant change in their government since Jair Bolsonaro was elected in October. Specifically, President Bolsonaro has shifted his nation to orient with right-wing politics. Though he has many international supporters behind his political regime, Nicolás Maduro would not be found on this list. Maduro of Venezuela has been targeted by Bolsonaro, as Bolsonaro has portrayed the need for Venezuela to “rid themselves of Maduro” (Phillips, 2018). Maduro has been engulfed in controversy by the endless accusations that his reelection was illegitimate. This reelection has prompted feelings of disdain among many Latin American leaders (Tharoor, 2019). Maduro carries an aura of rejection that has been brought forth by both his people and fellow leaders. He is experiencing isolation that is getting worse each day. This isolation is a result of the economic disaster that tore through Venezuela. As previously mentioned, Maduro’s first term was one of “malnutrition, preventable disease and violent crime” (Editorial Board, 2019). This promoted mass migration to Brazil and other neighboring countries. Finally, Maduro’s reelection has been portrayed as fraudulent. As a result, 13 governments proclaimed his presidency illegitimate (Editorial Board, 2019). Thus, President Maduro has been isolated by many countries. Nevertheless, a main supporter behind Maduro’s downfall is Bolsonaro. President Bolsonaro seeks to further separate Maduro from any governmental powers that he continues to hold. Bolsonaro leads his discourse against Maduro with the arguments that this Venezuelan leader has not acknowledged any course to improve the state of Venezuela’s economy. Simultaneously, other countries have separated themselves from Maduro. For instance, Colombia has isolated themselves from Maduro due to the stressors that his regime is indirectly putting on their economy. Specifically, Colombia is experiencing large influxes of refugees that has burdened their own economy. This is the case within any neighboring country and Venezuela. Thus, tensions are high among the borders (Rogan, 2018). In continuation, Bolsonaro stated on Wednesday, January 9 that Brazil would be leaving the UN migration accord. This act is symbolic of Brazil hardening their limits on immigration. President Bolsonaro commented that “Brazil has a sovereign right to decide whether or not it accepts migrants” (Londoño, 2019). Nevertheless, Bolsonaro’s anti-refugee comments are not to be forgotten. He has described the increasing numbers of refugees into Brazil by stating “the scum of the earth is showing up in Brazil, as if we didn’t have enough problems of our own” (Guardian staff, 2018). This portrays how hate sentiments are underlying this shift in immigration policy. Therefore, it is no surprise that Maduro reciprocates Bolsonaro’s hostility towards him. 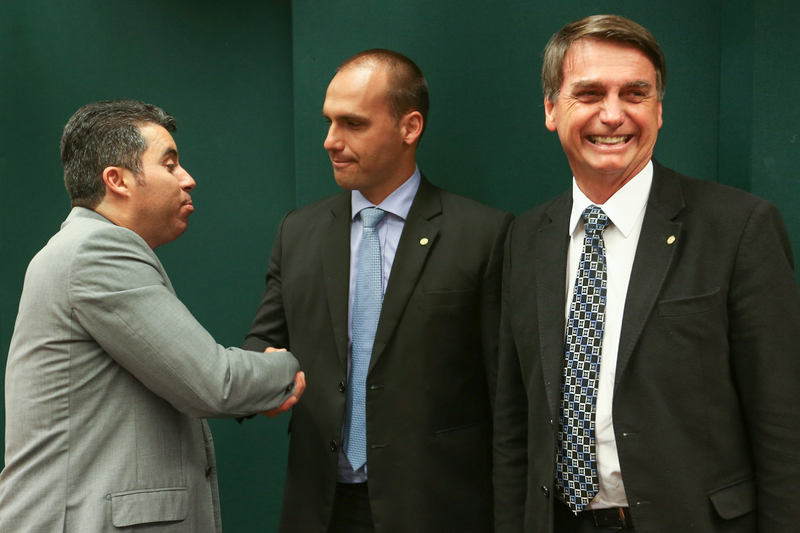 Maduro has seared Bolsonaro with the label: “fascist.” In addition, his foreign minister has denounced Bolsonaro as “the epitome of intolerance, fascism and the surrender to interests that go against Latin America and the Caribbean” (Tharoor, 2019). These comments may stem from Bolsonaro’s purposeful disregard of providing Maduro with an invitation to his inauguration (Tharoor, 2019). These leader represent two opposing political parties, as well as two different waves of politics that have shaped Latin America. Nevertheless, despite the animosity between Maduro and Bolsonaro, they are additions to the expansion of authoritarian leaders in Latin America. These leaders are proposed to continue to clash, as they represent two sides of the same coin. There is a dangerous aura that is established when two leaders with authoritarian tendencies are in conflict with another. Nevertheless, the tension between the two may be relieved soon since Maduro’s legitimacy as Venezuela’s leader is being challenged. RYAN LLOYD AND JOÃO CARLOS JAROCHINSKI SILVA. (November 13, 2018). "BRAZIL AND VENEZUELA: A STORM BREWING IN RORAIMA?". Ishaan Tharoor. (Jan 11, 2019). "The looming showdown between Maduro and Bolsonaro". The Washington Post. Tom Rogan. (Dec 10, 2018). "Alongside Colombia, Jair Bolsonaro's Brazil will pressure Nicolas Maduro's Venezuela". Editorial Board . (Jan 9, 2018). "Latin America has never seen a crisis like Venezuela before". The Washington Post. Tom Phillips. (Dec 16, 2018). "'Liberate' Venezuela from Maduro, urges Bolsonaro ally". The Guardian. Ernesto Londoño. (Jan 9, 2019). "Bolsonaro Pulls Brazil From U.N. Migration Accord". Guardian Staff. (Oct 29, 2018). "Who is Jair Bolsonaro? Brazil's far-right president in his own words".